More than 14,000 different varieties of plants are showcased in more than a dozen principal garden areas in this famous garden. 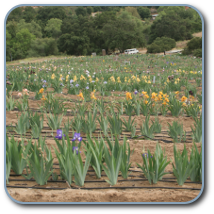 An iris garden has been planted for the AIS National Convention featuring guest irises from notable hybridizers. 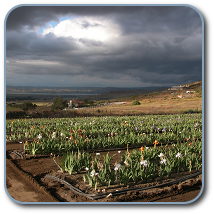 Located in Valley Center, Alex and Kitty Stanton of Stanton Iris Gardens grow over four acres of iris cultivars including new introductions from Kerr, Keppel, Ghio, Blyth and Lauer and many reblooming iris varieties. Located in the Jurupa Mts. Discovery Center. 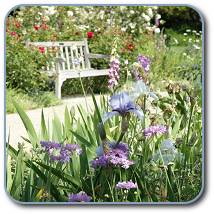 The Holk Memory Garden was established in 2005 and hosted the 2007 Region 15 Spring Trek. Along with the guest iris garden there other beautiful areas to explore: a rose garden, gazebo, a cactus and succulent garden and a patagonia garden. 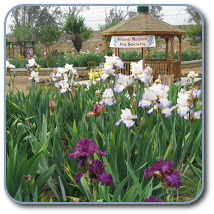 Well known for their dedication to growing reblooming irises, Carole and Paul Buchheim established Mystic Lake Gardens in Nuevo, California and grow over 2000 different iris cultivars. Also check out the information on the optional special excursion gardens.